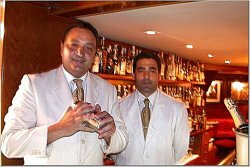 On my previous trip to Barcelona, the bartender at the Aris bar had recommended that I check out the Ideal Cocktail bar if I could. Unfortunately, the one day I was able to make it over, they were unfortunately closed. So it was of course on the top of my list to try out on my next trip, which fortunately happened only a year later. Even though my flight didn't arrive until quite late at night, no sooner had I checked into the hotel, but I was hot-footing it down the street to check out the Ideal Cocktail. I was pleased to find upon walking in the door that this was a very classic and comfortable feeling bar, and not some glitzy tourist bar. A long wooden bar snaked along one wall, and while the seating in the rest of the room was minimal, it indeed looked comfortable and relaxed. Lovely artwork in various styles was proudly displayed on the walls, most of it reflected a bar/cocktail motif in one way or another. The overall atmosphere that was presented was subtle and relaxed, and the noise level was relatively low, making it easy to carry on a conversation with whoever you might be with. My bartender was Jose Gotarda, and he mixed up my Old Fashioned to perfection. This was a very welcome treat after a very long day of traveling. In addition to the ½ orange slice, he also added half a lime wheel, which was an interesting and attractive addition. Instead of granulated sugar, they used simple syrup, and just a bare dash of soda. Instead of muddling the ingredients together, he simply stirred it with a swizzle stick, which worked quite well. Jose did mention that they normally made their Old Fashioneds with additional soda water, but he thankfully asked me if that was how I wanted mine. The Ideal Cocktail bar was clearly a local hangout with many of the customers appearing to be quite frequent regulars. I'm sure that you could pick up a lot of local gossip by just hanging out and listening to some of the conversations going on around you.